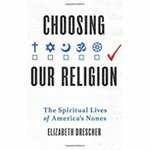 Drescher, Elizabeth, "Choosing Our Religion: The Spiritual Lives of America's Nones" (2016). Faculty Book Gallery. 198.